Surrounded by pastors at Grace Church, near Houston, Texas, he ceremoniously signed SB24 into law today. The law protects pastors from being prosecuted for their statements from the pulpit. "SB24 will give pastors critical protection from forced testimony and shield sermons from government subpoena power," said Lt. Gov. Dan Patrick. 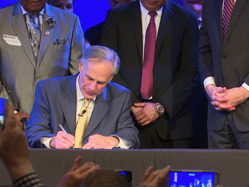 Although it was officially signed on Friday, the signing today marks a historic milestone: Texas pastors, are no longer at risk for sharing their conscious. Earlier this year, lawmakers pushed numerous other pieces protecting religious liberty. HB359, another Texas bill, would allow adoption agencies to make choices about who they allow to adopt without being in danger from prosecution. "(It) protects the rights of the faith-based organizations to exercise their religious mission to serve others without fear of retaliation," said bill author, Rep. James Frank. South Dakota Governor Dennis Daugaard signed a similar bill in March, which would not require an adoption agency to "provide any service under circumstances that conflict with any sincerely-held religious belief or moral conviction." They're slightly different, but these pieces of legislation all point to one important goal: protecting religious freedom.